The Peddars Way in 3 days walking. Good paths and signposting should make this walk suitable for the fit weekend walker. Please be aware there is one 19 mile day! Getting There: There is a train station at Thetford, your first nights stay. By Air: The international airports with best connections to the trail are Stansted or Heathrow. From Stansted it is 1.5 hrs travel time (change at Cambridge) from Heathrow it is 3 hours travel time, metro to Kings Cross then train to Cambridge, change for Thetford. Norwich has domestic flights and flights from Amsterdam (KLM) trains to Thetford (0.5 hour travel time). By Public Transport: By Road: From the south M11 (Cambridge) then A11 to Thetford. From the north: take M6 Toll and M6 to Newmarket Bypass/A14 in Cambridgeshire to Thetford. By Public Transport: Bus to Kings Lynn (travel time 0.45 hrs, busses every half hour) then onward travel by train. An easy to follow gentle walk through the Norfolk countryside. 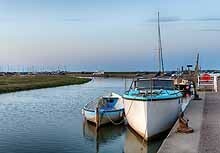 Finish on the beautiful Norfolk coast.